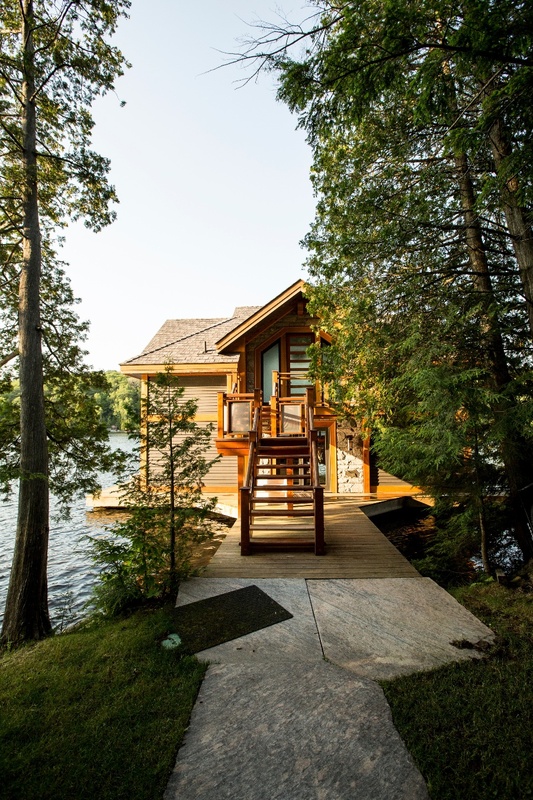 We chatted with our Senior Designer, Peter Groza, to learn how he designed this stunning boathouse on Lake Rosseau that’s as functional as it is eye-catching. 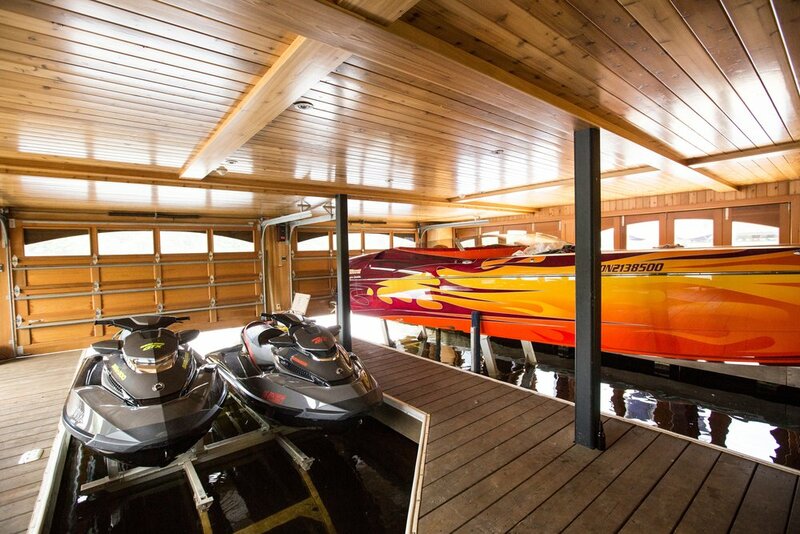 Every element was considered, every roofline thoughtfully planned, and every municipal regulation followed to a T. That’s what you call a boathouse success! 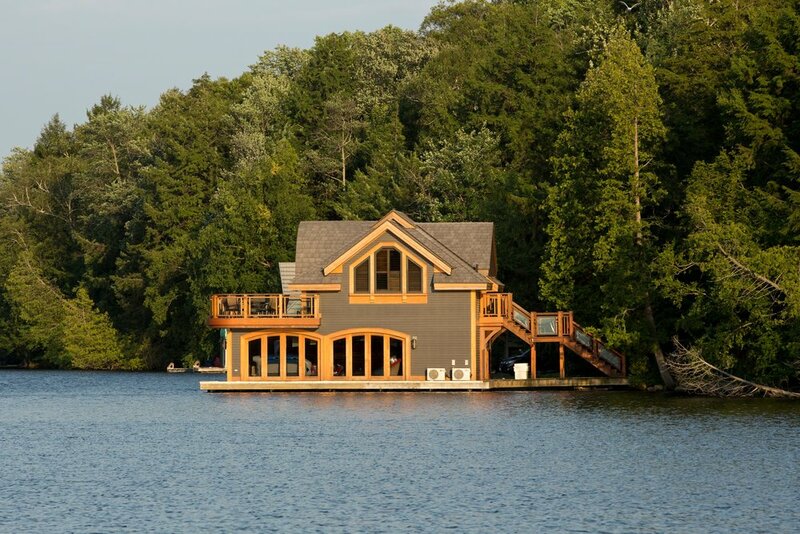 When you first met with the clients, what was their vision for this boathouse? They were previous clients — we had worked on their cottage— so we already knew they liked unique designs, with lots of texture and substance. We also knew they had a soft spot for elaborate timber frame, so we used those design cues as a jumping-off point. Walk us through the design for this beauty. We started with an elaborate timber frame, which we gave an updated look to make it completely unique. We installed lots of curves throughout, both in the rooflines and in curved timbers. We exposed all the rooflines, too, so that the beautiful beams and rafters could be seen from underneath, which meant we had to install solid, closed-cell foam insulation on top of the roof plywood and then clad it with a recycled rubber/enviroshake roof. Is this just a boathouse, or are there any other rooms/spaces? The clients requested a master bedroom with ensuite and sitting roomon the second floor so it could do double duty as a boathouse/guest house. Municipal regulations meant we couldn’t build bigger than 650 sf, so we knew we needed to design the right rooflines to open up the space. You’ll notice there are no flat ceilings anywhere, with a cathedral timber frame between each roofline to give us more vertical room to play with and to make the space seem soaring. We also added as much lakeside glass as possible to open up the space even more. We kept the mechanical room underneath, with some room for storage. We maximized the amount of space allowed to give them room to store some of their toys. Did you use any unusual or innovative materials in this build? We did, actually! The rooftop upper deck is made of burnt ash, very similar in appearance and resilience to ipe. Ipe is a popular material, but we discovered that ipe farming is displacing both wildlife and people, so we wanted to find a more environmentally-friendly alternative. Thermally-treated burnt ash is more cost-effective, lasts forever, and is locally sourced, so is the better option in so many ways. Keeping things as natural as possible was also a priority for us. All products we used were as VOC-free as possible (volatile organic compounds, a variety of chemicals, some of which may have short- and long-term adverse health effects). We also used only natural colours and textures on the wood finishes inside to really keep the natural look. Finally, moisture is always a concern in a boathouse, so we stayed away from oriented strand board (OSB) and went with solid wood web joists instead to reduce the impact of moisture on the boathouse. Ditching the OSB also reduced VOC’s, so it was a win-win. What were the biggest challenges you faced when building this boathouse, and how did you get around them? We had two big challenges on this build. The first was to fit the boathouse within the confines of the municipal regulations and still revise the slip size to fit the boats, while at the same time working around the confines of new-ish crib docking. We also didn’t want to disturb the lake bottom by demolishing anything. So, we started by getting rid of some rotting wood and installing steel piles around the crib, to give us a bigger footprint for the dock and boat slips. Then, we installed the steel structure on which we built the new docks and enlarged slips, which were big enough to accommodate a 30’ boat. The second was being creative and giving clients the boathouse of their dreams while working within the bylaws and regulations. Municipal regulations and township regulations are always quite strict for boathouses. In this instance, the township dictated the elevations, and the municipal regulations mandated a small structure. Our clients had asked us for something elaborate and grand, so our challenge was to design something that wouldn’t overbalance the timber frame. We created an efficient floor plan with detailed style and proportioning to make everything seem larger, without ever going over our mandated 650sq ft!